"I've just sat on my flute ..can you repair it?" "My trumpet valves keep sticking ..can you repair it?" "I've just found a split in the back of my violin ..can it be repaired?" "It was my Grandmother's piano, I think it needs a lot more than tuning..can it be restored?" and are quite used to giving the answer "Yes". 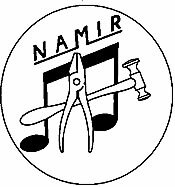 But it is important to find the right repairer for the instrument and it is useful to understand a little of what is to be done. 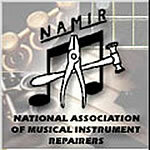 Most musical instrument repairers offer to carry out on woodwind instruments the following category of repair: - checkover and put right, service (when the instrument is dismantled, cleaned and faults put right, and re-pad or overhaul (when all pads and most corks are replaced) along with the work done in a service. A checkover should be requested whenever the instrument seems not to be playing at its best, or before an exam or concert. A service on these instruments should generally be carried out every one to two years. Typically after this time the instrument will start to look a little dirty with fluff accumulating behind the keys. At this point it is likely that a few of the pads may no longer be seating as accurately as when new and the rod screws will need oiling. A re-pad becomes necessary when most of the pads are becoming worn or seat badly and cannot be improved without a great deal of work, which would not necessarily provide a lasting solution. Re-pads are not often required on instruments less than five years old unless there has been some damage to them not directly related to playing. Repair work on brass instruments essentially includes servicing of valves, servicing of slides (and their removal when stuck), servicing of waterkeys and general bodywork repairs as required by the customer. In addition many brass instrument repairers also will arrange for a brass instrument to be re-lacquered or re-plated when desired by the customer. When a brass instrument fails to speak in its normal manner this will be because there is either a constriction somewhere in the tubing (you would be amazed at some of the things extracted from brass instruments - including live gerbils!) or there is a leak somewhere. Perhaps a leak due to poorly fitting valves, a joint that has become unsoldered or a tube that has split from internal corrosion. All of these faults can usually be repaired. String instruments fall into two categories, unfretted (violin family) and fretted (guitars and mandolins etc) and not all repairers carry out work on both families of instruments. It is important that when any of these instruments are stored unused for a length of time that they are not put in a loft or other uncontrolled environment. Considerable damage can occur to the wooden bodywork of these instruments under these conditions, with joints opening up and cracks appearing, all resulting in an expensive repair. Repairs to Pianos fall into several categories. Most become identified when the piano tuner visits the instrument for the first time. Repairers can replace damaged parts of the action and where necessary make new parts for the keys or other moving items, as spares are rarely available. Missing ivories can be replaced with attention given to matching the colour of the original. When the case is damaged or the French polish in poor condition, repairers can generally restore the instrument to a good standard of appearance. Repairs can also be made to the frame where it is no longer able to take the tension imposed by the strings. Some piano tuners also carry out repairs but others will refer the customer to a repairer when necessary. Repairs to percussion instruments include all types of repair to drums. Marching drums, such as snare drums, tenor and bass drums can be serviced and can also be recovered to alter the marking when required. Replacing the heads on these drums is sometimes done by the player but will be done by the repairer on request. With timpani repair, the repairer can overhaul the pedal mechanism, replace the heads and deal with bodywork damage as requested. Some percussion repairers also offer to restore old rope tension drums that can be used as decorative features rather then for playing. Retuning of mallet instruments such as the xylophone is a specialist repair, but some repairers offer this. Where significant damage or tuning problems occur it may be more economical to buy a new one.